Hot Stone Massage is a variation of the classic massage, using similar movements, concentrating on the same muscle groups, improving joint movement and your bodies circulation… but… with a heated twist – Smooth heated volcanic stones from the river bed’s of our very captivating and scenic South Island. Muscular aches, pains and strains. Working any part of your body that is in desperate need of pampering (most common back & shoulders). This is absolute heaven. This is a full body massage – full indulgence! Starting on the back of the legs, working around the hip and finishing with a complete back massage. Gently turning to the front , concentrating on the legs, arms and top of the chest – this whole experience is incredible! If you have never had Hot Stone Massage before we recommend you give it a go and treat yourself. Your treatment will be customised if required and discussed during your consultation when you enter our peaceful rooms. 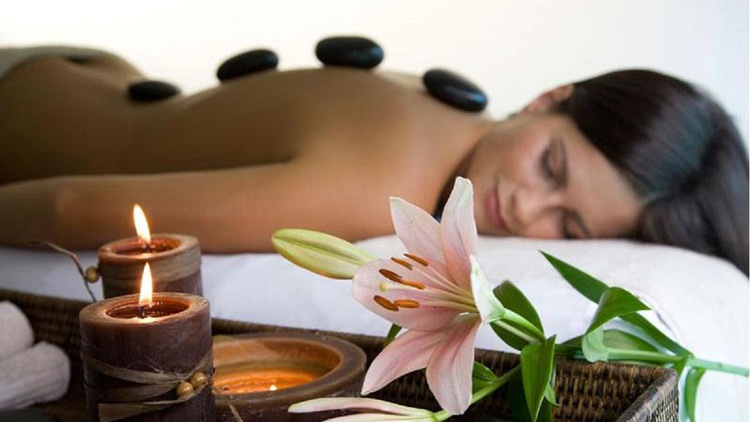 We will also combine the stones with our Pedicures, Manicures snd Facials – for the complete pampering. This massage is in a world of it’s own and our therapists will do everything possible to make sure your Hot Stone Massage is an experienceyou will never forget. This massage is absolutely indulging – completely rebalancing your body and mind. You will instantly feel calm and at peace with yourslef, freeing your mind as your therapist gently glides the smooth stones over your body and muscles.